To copy a DVD-9 movie to a blank DVD-9 disc with Any DVD Shrink, you need at least two DVD drives and at least one of them is a DVD burner. Then follow the steps below. 4. Insert a blank DVD-9 disc in another DVD drive which has DVD burning ability. 5. 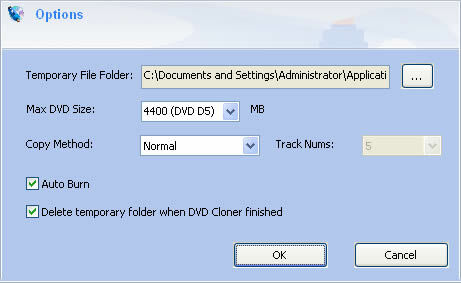 In output device dropdown list, select the DVD drive where the blank DVD-9 disc was inserted. 6. Click Copy DVD button and Any DVD Shrink will start to copy the DVD-9 movie to the inserted DVD-9 disc. b. If you don't uncheck any items from the source disk, you will get 1:1 DVD copy. c. You can uncheck any chapters, titles, subtitles or audio tracks that you don't want to write into the new disk. d. Please make sure your DVD burner supports dual layer DVD disc (DVD D9).